After studying Food and Nutrition at the University of Tennesssee at Chattanooga I know what the body needs to grow, how to get the body to respond to proper eating programs and how to guide individuals to a healthier lifestyle through improved decision making and discipline. Don't be confused or persuaded by public media influence when it comes to learning how to be healthy. YOU WILL LOSE! 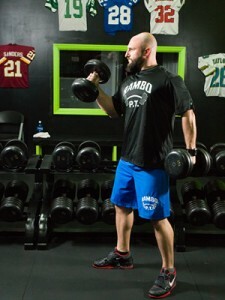 I teach resistance training, strength training and weightlifting which includes: Basic and advance weightlifting technique and form, Compound and isolation exercises, Olympic lifts and progressions, full-body circuit exercises and I provide you with an individual weightlifting programming. This means you train smart and efficeint to get results! It's no secret – fitness training has been proven to prevent disease, strengthen your health and improve your confidence and outlook on life. As a certified fitness trainer, I'm deeply trained in everything from muscle mechanics to flexibility and cardiovascular dynamics. So if you want to live a stronger and more confident life, I've got the training and the expertise to help you every step of the way.